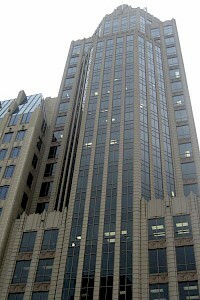 The Elihu M. Harris State Office Building is a high-rise located in downtown Oakland, California. It has 22 stories and stands at 328 feet (100 m) tall. 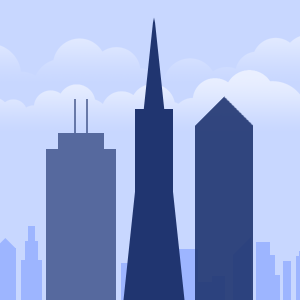 The building is named for Elihu Harris, a former mayor of Oakland who is still living. Fifth Third Center is a 302ft (92m) tall skyscraper in Columbus, Ohio. It was completed in 1998 and has 25 floors. Miller & Reeves designed the building, which is the 17th tallest in Columbus. The Pete V. Domenici United States Courthouse is a federal courthouse located at 333 Lomas Boulevard NW in downtown Albuquerque, New Mexico. The building was completed in 1998 and named in honor of Senator Pete Domenici at a ceremony in 2004. Since its completion it has been joined at the intersection of Fourth and Lomas by two additional courthouses, the Bernalillo County Courthouse on the southwest corner and the Metro Courthouse on the northwest corner. 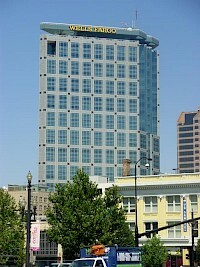 The Wells Fargo Center is a skyscraper located in Salt Lake City, Utah, United States. It was built in 1998 and is the tallest skyscraper in Utah, standing 24 stories above street level and 400 feet (120 m) tall at roof level, 422 feet (129 m) at its highest point (does not include antena).